Coronary CT Angiography as the Gatekeeper to the Cath Lab: Where Are We? Accounting for the excellent negative predictive value of CCTA for CTA, it has been a long-standing goal to utilize it as a gatekeeper for invasive coronary angiography to utilize resources more efficiently and further reduce patient’s treatment burden. However, this idea is not supported by available scientific evidence in prospective, multicenter studies contradicting numerous case reports and single-center observations. 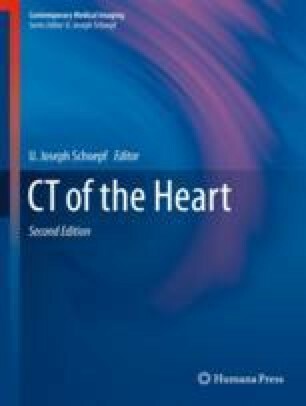 This scientific evidence will be challenged by the CONSERVE (Coronary Computed Tomographic Angiography for Selective Cardiac Catheterization) trial (NCT01810198), which is directly testing the concept of CCTA as a gatekeeper to ICA. Mangold S, Wichmann JL, Schoepf UJ, Caruso D, Tesche C, Steinberg DH, Varga-Szemes A, Stubenrauch AC, Bayer RR 2nd, Biancalana M, Nikolaou K, De Cecco CN. Diagnostic accuracy of coronary CT angiography using 3rd-generation dual-source CT and automated tube voltage selection: clinical application in a non-obese and obese patient population. Eur Radiol. 2016. https://doi.org/10.1007/s00330-016-4601-2. Investigators S-H. CT coronary angiography in patients with suspected angina due to coronary heart disease (SCOT-HEART): an open-label, parallel-group, multicentre trial. Lancet. 2015;385(9985):2383–91. https://doi.org/10.1016/S0140-6736(15)60291-4.